Top 3 Reasons to Start Texting Review Requests to Your Customers NOW! Are your online customer reviews making your business look bad? Requesting feedback from customers by text message will quickly increase your star ratings. After a customer gives you positive feedback in a survey, take them to a custom landing page, thank them for their time and ask them to share their feedback on top review sites, including Google and Facebook. 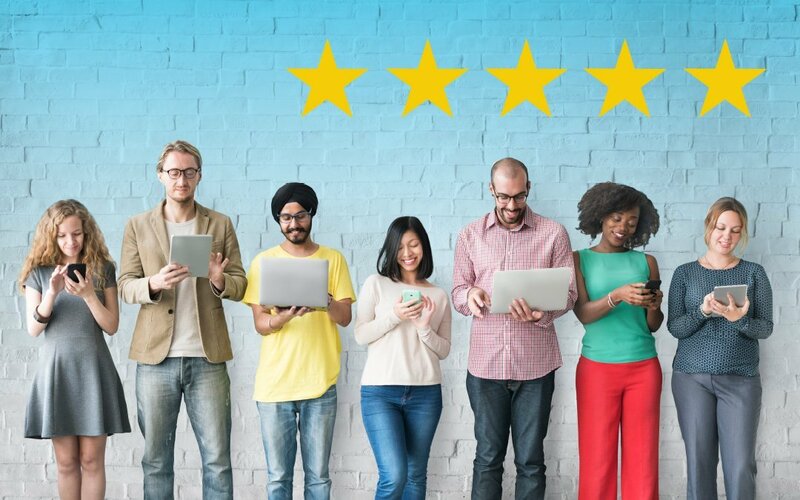 When they click the link, a 5-star review will automatically populate – encouraging your customers to share their wonderful experience on your review sites. Our clients have put this process into action and have seen incredible results! Your online star ratings are insurance for your advertising dollars! 99% of all text messages are opened by recipients. In our tech-savvy, mobile world, it is pretty much a no brainer to reach out to customers via text message! Text messaging allows you to catch your customers when they’re at their happiest point in their purchase. In fact, you can send them a survey request immediately after their transaction! According to SurveyMonkey, 67% of consumers say they are open to completing a survey and 1/3 will give you actionable feedback. While you shouldn’t pay for positive reviews, you can “thank” customers for their time. We offer our clients’ customers a monthly drawing for a $500 gift card – – paid for by us! By texting review requests to their happiest customers, our client, Mercedes Benz of South Orlando, received 142 positive online reviews in one month! 3. Texting Review Requests is Easy! Many businesses may think this process sounds too technical and too hard to put into place. Simple training for your entire sales team can fix this issue before it becomes one! Once your staff is trained on the simple process of texting review requests, your mobile surveys will be up and running in no time. We make it fun for our clients and give them an incentive to use the texting technology – – a VIP trip for two to Scottsdale, Arizona, paid for by us! Requesting reviews by text is a simple change in the process of getting customer feedback and making it a fun tool for your staff to use will benefit your business in the long run with increased positive online reviews! Now that you know the importance of requesting reviews, schedule a 10-minute demo to learn how you can start improving your reputation with a streamlined survey process!